cause (a smartphone or other electronic device) to become completely unable to function, typically on a permanent basis. 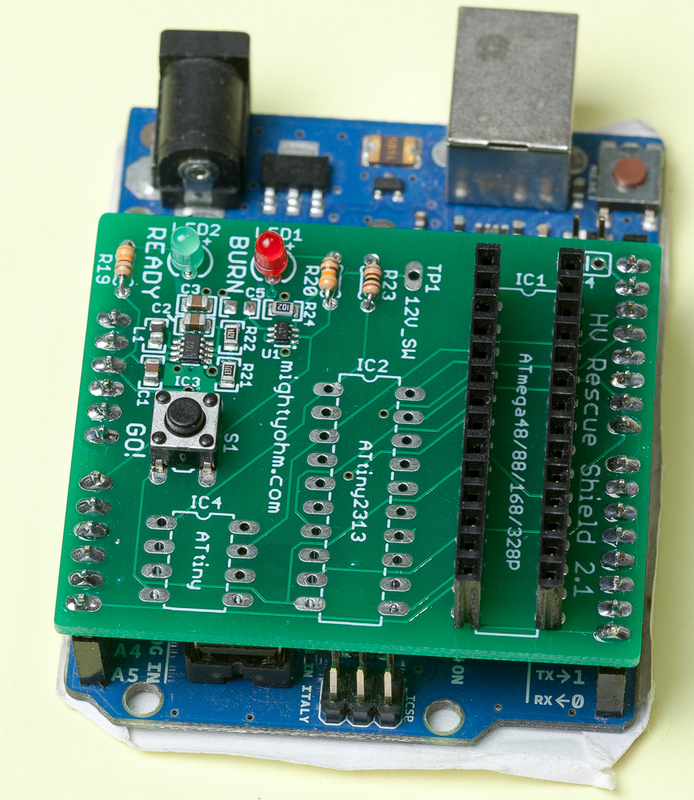 Lately I’ve been working on a custom “arduino clone” board that uses SMD version of ATMega328p microprocessor. This is what it looks like, magnified. It really is a tiny IC, size of small fingernail, yet it’s same (internally) as processor used in Arduino UNO and many of it’s clones. However I’ve managed to “brick” quite a few of these in the process of developing board. Chips appeared to be completely dead, not accepting ISP programming or showing any signs of life. It is not physically damaged, no. Something caused it’s internal settings to lock. Fortunately there’s a way to bring these chips back to life with high voltage parallel programming. Easiest way to do this is with Arduino add-on HV Rescue shield sold on mightyohm.com. 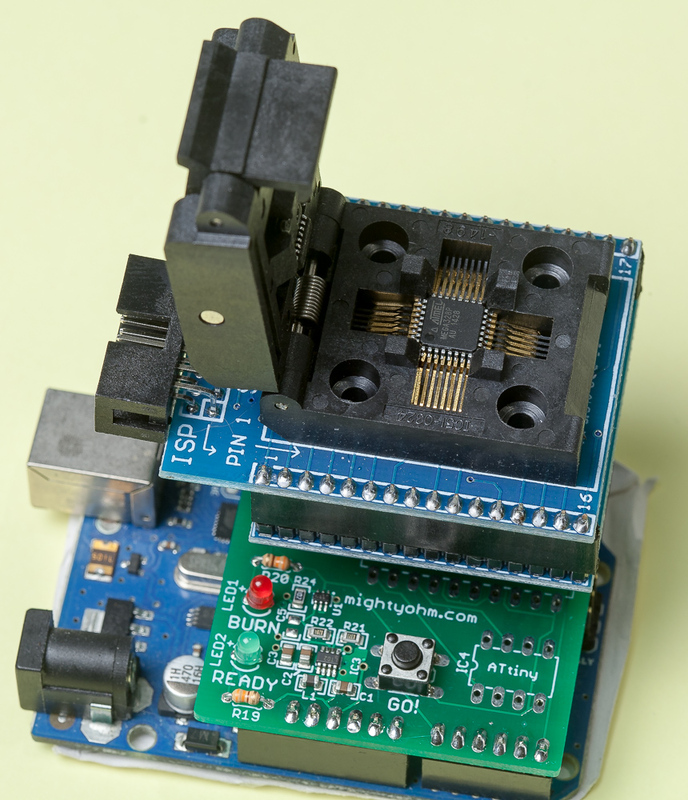 Unfortunately it is meant for standard thru the hole DIP (dual in-row pins) packaged chips. I spent few days trying to find a solution for SMD package (TQFP type) and din’t find one. Only solution seems to be is to desolder chip from the board using hot air, put it in junk pile and after cleaning pads solder new one in it’s place. These chips are not expensive so it’s not a huge deal, but still it’s a waste. So eventually a solution was found. 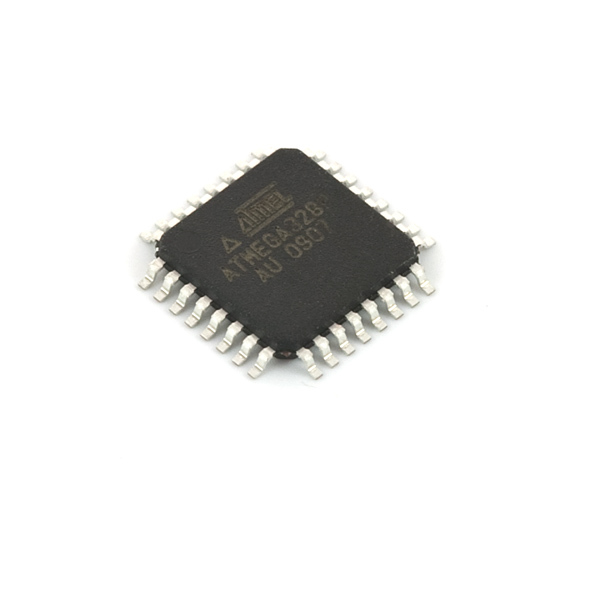 There’s a Zero Insertion Force sockets (ZIF) made for TQFP microchips! These go for under $25 on eBay (just search for TQFP to DIP ZIF adapter). Just put your microprocessor on the special pad and close lid to engage contacts. 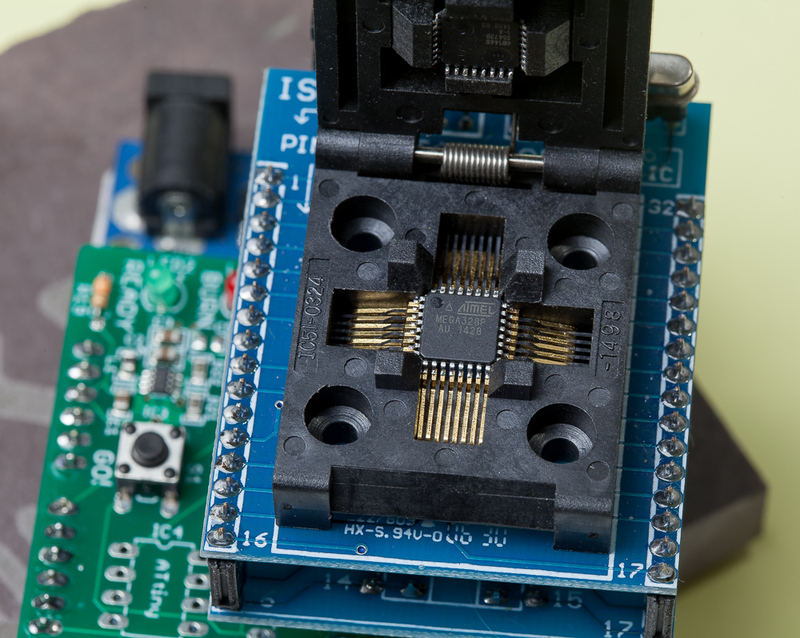 On the bottom there are 28 standard 0.1″ headers that can be plugged into breadboard OR into HV Rescue shield! There’s only two modifications you’ll need to do. When assembling HV Rescue shield instead of 28 IC socket, solder two 14 pin female headers. 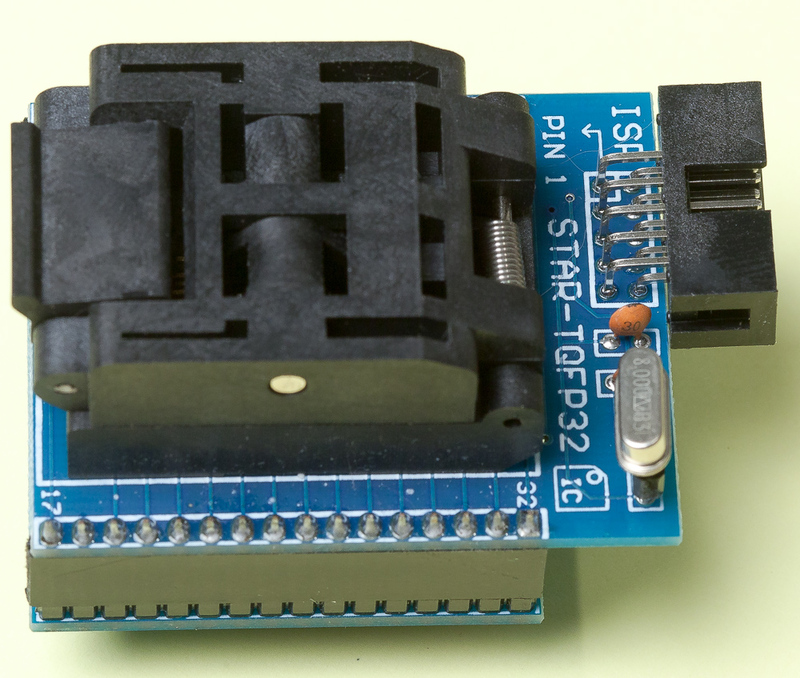 Keep in mind that you will not be able to insert regular DIP chip there anymore, but it’s easy to make an adapter for it with piece of perf board, male headers and some solder. If you get same socket as I did, it will have it’s bottom row of pins wider than standard ATMega328p chip. Not a problem, just solder male header rows in between. Another thing to consider is that for some strange reason MightyOhm’s sketch for the shield did not work for me, however alternative one did! In some cases I had to run program several times, but I resurrected every single bricked ATmega chip I had! Also I realized that I can pre-program microprocessors with Bootloader and set fuses without soldering! That greatly sped up assembly process. 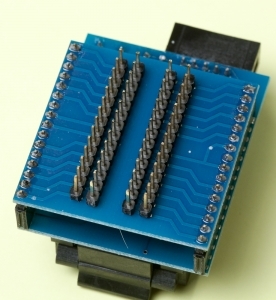 Of course you will still need to desolder bricked SMD chips with hot air, and then solder them back, and yes I do realize that I spent about $50 to rescue few $3 microprocessors, but added bonus of being able to pre-program bootloader is worth it for me. Final warning, chip might get stuck in the adapter’s cover. I only realized I had extra one there after I looked at this picture 🙂 Woops!